There is an easier way to it. Start with the cluster intact. Do a needle sweep test (hold down the trip reset button while turning the key to "On"). Make a note where the needles rest at each stop. For consistency, do this more than once. After you are done with your needles, place them on the gauge posts just enough so they wont fall off, and do the sweep test again. Once you have the needles where you want them, attach fully. I'm thinking it might be possible to desolder the odometer EEPROM memory chips (I assume they're hidden by the green board) and swap them. It'd be nice if I had another board to test that theory. I'll have to take a look at the EEPROM chips (assuming they exist) and determine if they are similar enough to be swapped. There are a few threads on the Internet where people have de-soldered the chips and swapped chips in reference to different types of vehicles. The Lexus weblink talks about throwing in a DIP socket. Energy output of the chip should remain constant if you can swap out digital odometer cables with read-out. I'm just concerned about energy input to the chip, as that might fry the chip if not controlled: It'd be like giving a lightbulb too much power (pop!). There might be a way to check a circuit board for how much energy is going to a chip, which would cost much less than getting a scanner. The large squarish chip appears to be a microcontroller. That might be the thing that has to do with the odometer. I reason it'd be more complicated being a microcontroller. The little square next to the odometer cable plug-in seems to be related to temperature, so I'm thinking maybe it has to do with the coolant thermostat. Seems to me that a person needs a digital programming tool as a way of manipulating the microcontroller. I guess if the microcontrollers were the same, then it might be possible to just unsolder and swap; but I don't know enough about microcontrollers to be firm on that belief. Just wanted to add something to this thread, 'for future reference'. Apparently, the 'donor' cluster that I picked up, must have come out of a car with SKIM..... Because that stooopid red circle / dot came on, after I started the car up. I removed the cluster, and pulled out the offensive bulb. It was not a big deal, but it would have saved me a bit of aggravation - Had I known to remove the bulb BEFORE I installed the cluster in the car - And replaced the dash pad, etc. 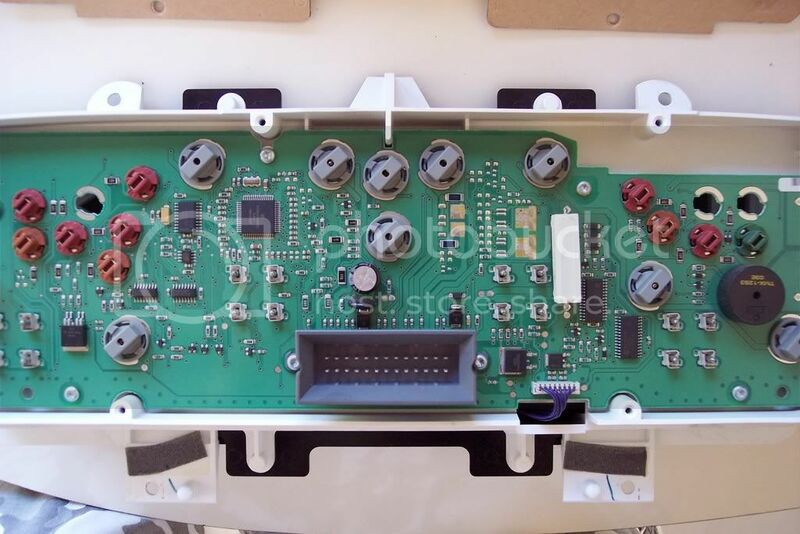 Just wanted to mention this to others, who might be replacing a dash cluster - If you are installing a cluster, into a *NON*-SKIM or 'Non-sentry' Neon, from another car - It might be a good idea to check for the Sentry bulb, and remove it if necessary..... BEFORE installation.